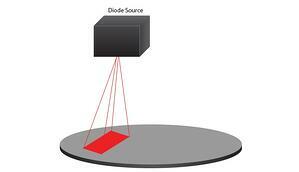 Cost effectiveness: Diode lasers have electrical-to-optical "wall plug" efficiency of over 60%. This power efficiency coupled with low maintenance and long lives add up to considerable long-term cost savings and very short return-on-investment. Processing speed: Variable power and on-the-fly changes to beam shape allow direct diode heat treating systems to process materials much faster than other technologies. No machine reconfiguration is required during the part change-outs, processing speeds are much faster, and throughput is configurable. Flexibility: A single diode laser system can provide multiple powers, beam sizes, and wavelengths from a simple user interface. Brightness: Diode lasers can offer a brightness over 10 kW/cm2, allowing for very fast processing times. Reliability: Diodes lasers offer operational lifetimes over 50,000 hours. They require no routine maintenance and degrade gradually over time in a predictable fashion. Compact: Direct diode heating systems can house the laser, optical elements, and even the drive electronics within a single, environmentally secured box. In upcoming blogs, we will go in to more details about the advantages of direct diode heating and why more manufacturers are choosing lasers over other forms of remote heating. Subscribe at the bottom of this page! To learn more about using direct diode heating for your industrial laser application, take a look at our direct diode source product page or download our white paper, Direct Diode Heating: Shaped Light Delivery for Heating Applications.